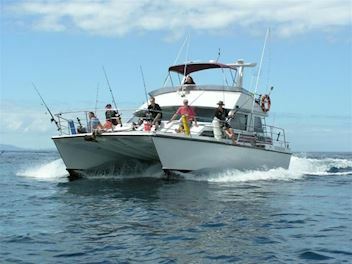 Auckland Fishing Charters - Double Rum Charters Fishing, diving, team-building, parties, cruises, team building, bird, whale, dolphin, photography, boat charters. Our Luxury Auckland Charter Boat provides Charters for: Fishing, Diving, Team building, Parties, Stag Parties, Functions, Corporate Events up to 22 people, Cruising the Harbour, Bird/Dolphin/Whale watching, Photography, Boat Charters, we do them all. We always provide two crew to help on the Fishing Trips and Auckland Harbour Cruises. We are also known as Gulf Harbour Charters. 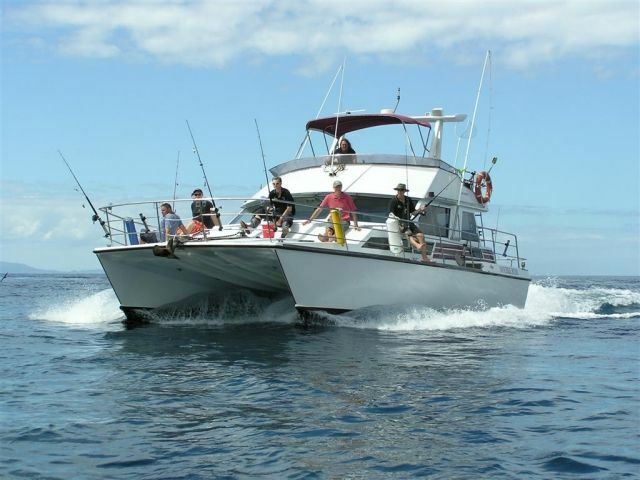 The Charters we specialise in are also: Deep Sea Fishing which is a great fishing holiday as our boat has four double cabins, Sports Fishing, Snapper Fishing around inner and outer Hauraki Gulf, and Guided Fishing trips. We are an Auckland Charter Boat based at Gulf Harbour Marina. We can pick up also from Downtown Auckland, Westhaven Marina, Bayswater Marina, The Viaduct, Halfmoon Bay Marina and Pine Harbour. Fishing: DoubleRum has been a Gulf Harbour Charter Vessel for over 14 years. We depart from Gulf Harbour or Auckland any time the client wishes to depart. We fish the outer reaches of the Hauraki Gulf in the middle area mainly in 55-60 meters out past the Cables. Our boat, due to its size, fishes 12 comfortably on the drift. Diving Trips The Barrier in winter offers a unique experience. We do a two night visit with five Divers living on board. We explore the cliffs of Catherine’s Bay and the glassy clear waters of Arid Island doing three dives a day. Visibility in winter is close to 90 feet. Water temperature is not cold. It surprises us actually how warm the water is around the Barrier. Cruising Auckland Our Boat is designed for Functions, Boat trips, Party Cruises, Sightseeing in Auckland Harbour for up to 22 persons Cruising the Harbour. We love going up to Kawau for a day visit to Mansion House Bay or Vivian Bay and also across to Waiheke Island. For evening Boat trips we recommend an on board Barbeque at Tiri Tiri Matangi and a walk at dusk up the native tree lined tracks. We Can pick up from Downtown Auckland Viaduct area, Gulf Harbour, Pine Harbour, Half Moon Bay and Bayswater. We do Dolphin watching trips and during August to December we see often Whales on most trips. We have a great stereo system which makes us a great Party boat and Harbour sightseeing. RATES: All our price rates include Rod Hireage, Bait, Ice, Fishing Tackle and Berley for Your Charter Boat Hire. Please visit our website http://www.doublerum.co.nz/ to view a more detailed list of prices on trips we have on offer. Phone: 0800 247 237 if you have any other queries or would like to book.